A year has passed since I went on my Northern Territory adventure. I had planned to leave for 3 months over the Christmas period in 2014 but, as so commonly happens up here, I fell in love with the work, the NT and the wide-open spaces. I thought it was time to update readers on what I’ve been doing. 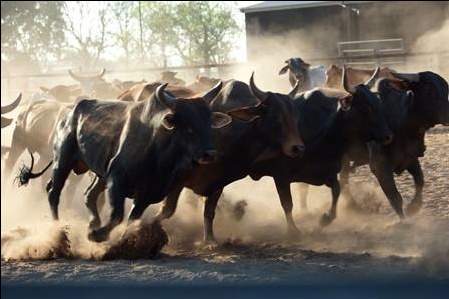 After working in the Northern Territory for three months I moved a bit closer to civilization – Julia Creek in rural North West Queensland where I began teaching students through School of The Air while living on another Cattle Station with a young farming family. This is known as being a Governess. This job role has been around for a very long time but it’s not as old fashioned as it sounds! Basically, the complete educational and wellbeing needs of the children were in my hands. I worked this role while continuing to finish off my Bachelor of Education via distance. This role was a temporary role that led me to my next adventure- Life Education. Since June, I have been working for Life Education- Australia’s largest provider of Drug and Health Education to students. You might recognise the mascot- Healthy Harold! I have been towing a big 5th wheeler van around North West Queensland from Emerald across to Longreach, out to Camooweal (almost the NT boarder) then back across the Flinders Highway to Townsville. This has been an incredible opportunity where I have worked with many different students, learning abilities and environments. I am excited to say that my nomadic adventure have almost come to and end with me moving back to Victoria in December. I look forward to seeing all the Bug-a-Lugs families again in the near future. I am having the best time up here. The wet season has started and everything is turning green. It is so beautiful. As we are so remote and don't have many safe swimming holes we were invited to attend a School of the Air Swim Week in Katherine. Katherine is about 9 hours drive from us so we left last Saturday. On the way we stopped at some pretty cool places like Heartbreak Hotel, Highway- In, Mataranka Thermal Springs & Daly Waters Pub. Once arriving in Katherine, we met other kids from remote stations and got right onto learning how to swim. These kids range from 3-10 and all had very basic swim skills. Over the different days we did different work shops and I got to teach a group of students aged 5 how to swim which I found to be very rewarding. We had planned to go to the cinema one night in Katherine but when we arrived they had decided to close for the night because it seemed quiet. That wouldn't happen in Bendigo! I am learning so much up here in the NT but it is very different form home! I’m quickly falling into a routine here with the children. It is extremely hot out here and I wish I had brought more dresses up with me! There is no TV and very scarce internet so a lot of my spare time is spent reading books, exploring or riding horses. 6-7am- Arrive at community to help children prepare for school. They wash their own uniforms and have to wear a school shirt, any pants they would like and some shoes to school. They don’t have to take anything as the school provides most of it. 8-10am- Schoolwork provided by teacher while I feed baby cows, baby turkeys, baby goat and the pet turtle. 10-10.30am- Recess. I prepare the food for the school children- usually fruit salads or biscuits with milk or water. We have to be very careful with how much we eat, as we don’t want to run out of supplies before the next grocery delivery. Last wet season, a plane dropped food off as the community ran out of food a lot faster than they thought they would. 10.30-12.30pm- Younger children are with me for the rest of the day doing educational activities such as writing letters to relatives, making craft, reading or creative play. 12.30-1pm- Lunch with all the school children. I prepare this and it is usually sandwiches, water and fruit. We have beef sandwiches usually as we have so many cattle on this property to eat! Today though, we had hamburgers. Yum! 1pm-2pm- Older children return to school and I look after younger kids. Usually, we do activities like water play, puzzles or ride bikes. It is very hot out here. It has reached 40 degrees most days and a low of 23 at night. 4pm-6pm- Prepare next days activities. There are so many snakes out here. I see Pythons daily. As it is the weekend today I went into the main homestead and helped the owners brand, de-horn and ear tag the bulls they mustered up this week. It was really interesting to see how they do it all. This is my baby goat that I look after. He is adorable!